A Weed by Any Other Name, Any Name PLEASE! The word “weed” has such a nasty and undesirable connotation. We hear the word and we immediately want to rip out the offending plant or worse yet, spray it with awful herbicides. Merriam-Webster defines a weed as “a plant that is not valued where it is growing: one that tends to overgrow or choke out more desirable plants”. I disagree with this definition because many of the plants growing in my yard have “weed” right in the name and these ‘”weeds” are not only valued by me but by the many species of wildlife that benefit from these weeds. Until all native plants get a better marketing strategy, please look beyond the names and consider the plants value in your landscape. I have 3 types of Asclepias sp. milkweed growing in my yard-Incarnata swamp milkweed, Tuberosa butterfly weed and Syriaca common milkweed. I enjoy their beautiful colors but more importantly this “weed” is the only plant that the Monarch Butterfly will lay her eggs on. This is the only host plant for the Monarch caterpillars. When the eggs hatch the caterpillars rely on the milkweed plant to sustain them through the 5 instars stages before becoming a chrysalis and then a beautiful butterfly. Without this weed we would have no monarchs. 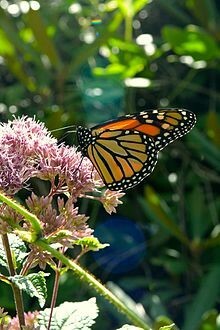 Another weed growing in my yard is the Eutrochium purpureum Joe-Pye-weed the gorgeous vanilla-scented rosy pink flowers are a butterfly magnet. Last summer the swallowtail butterflies swarmed this plant. It can grow to a towering 4-7’ and is ideal in perennials gardens and butterfly gardens. You can get shorter varieties if the height scares you! You will often find moth species and other pollinators on Joe-Pye-weed. 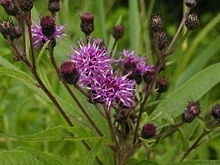 Vernonia noveboracensis New York Ironweed is another tall growing butterfly magnet. This tall, narrow plant will fit nicely in the back of the garden as beautiful border plant. The reddish-purple blooms will not only serve as nectar source for many types of butterflies but the seed heads can be left up throughout the winter to nourish many small songbirds. Along my side steps and among the front garden I have Helenium autumnale or commonly called sneezeweed. Not only does the name contain the offensive word weed but they have added sneeze to its name, causing some to think it induces an allergy attack! I can honestly say this plant does not cause excessive sneezing unless you are using the dry leaves as snuff to rid your body of evil spirits as it was thought to do. It does however attract an array of butterflies and small pollinators. This late summer to fall bloomer can be excellent sources of energy as monarch start their fall migration. One of early spring bloomers that flowers for several months is the dainty pink flower of the Dicentra eximia, commonly known as wild bleeding heart but it also has been referred to as staggerweed. The lovely heart shaped flower and fern like foliage looks beautiful in my shaded woodland area and is an excellent source of nectar for early pollinators. There is nothing weedy about this plant! As we continue to investigate the weeds growing in my yard we cannot forget about the aquatic ones growing in my pond. The Pontederia cordata or pickerelweed has a beautiful purple bloom that is not attractive to our eye but an important habitat for frogs and fish. It is also a food source fort ducks, turtles and other wetland critters. Another gem that is referred to as a weed is Impatiens capensis or jewelweed. This spotted orange flower attracts hummingbirds as the opening is perfectly adapted for these popular birds to reach the nectar. This annual plant will self-sow to replenish itself each year. Before you deem it a weed and yank it out consider what you are giving up, the joy of a flittering hummingbird on a bright summer day! I have been told the leaves of this “jewel” can be used to treat poison ivy! Finally, the misunderstood Phytolacca americana or American Pokeweed. This tall, large leaved branching plant have clusters of white flowers that becomes a dark purple berry will nourishes many birds in early to late fall. Although the berries and roots can be poisonous the newly emerging shoots are often gathered before they turn pink and cooked and eaten (I do not recommend trying this!). 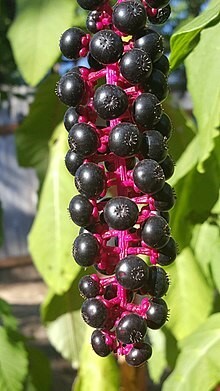 The berry juice was used as dye by colonists. The next time you are deciding on what plants to add to your gardens please do not disregard a plant because it has weed in its name. Instead take the time to get to know the plant and understand its important place in our landscapes. Many of those weeds are not weeds at all but rather an important part of the ecosystem with a high value in creating biodiversity.